2701 LOBMAYER IN NAGY SZOMBATBAN. AN EARLY MINIATURE LATERNDLUHR BY THIS FAMOUS MAKER. CIRCA 1820. A beautiful and rare early walnut miniature Laterndluhr. 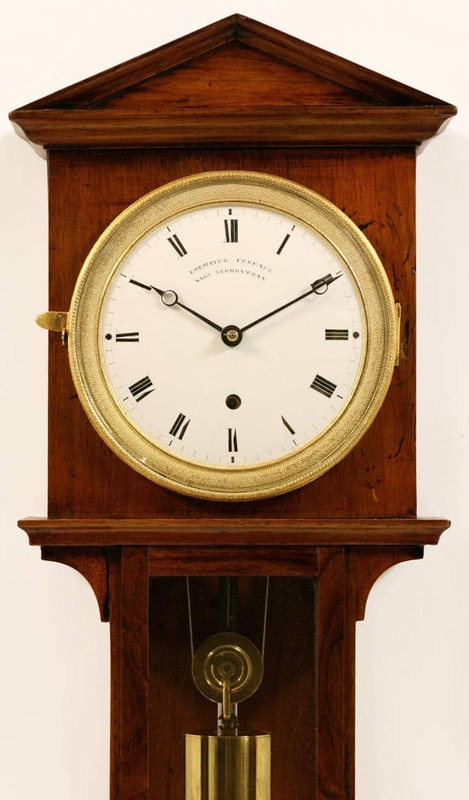 The case is instantly recognizable as a Lobmayer as he is the only maker to have produced these small clocks in this style. It has an ogee pedimented roof with a fixed hood with solid front panel and then progresses via a throat moulding to the slim central trunk and then out into the bottom box in which the bob hangs. The under curved base is of double stepped form and quite different to the bases formed on later fully formed Laterndluhrs. The front of the case has a full length lift out door rather than the much more normal trunk door and bottom door. This enables the whole of the pendulum to be viewed. The enamel dial is signed for the maker ‘Lobmayer Ferencz Nagy Szombatran.’ The dial has Breguet hands and Roman numerals. The dial is enclosed behind a beautifully engine turned and gilded bezel with a domed glass. 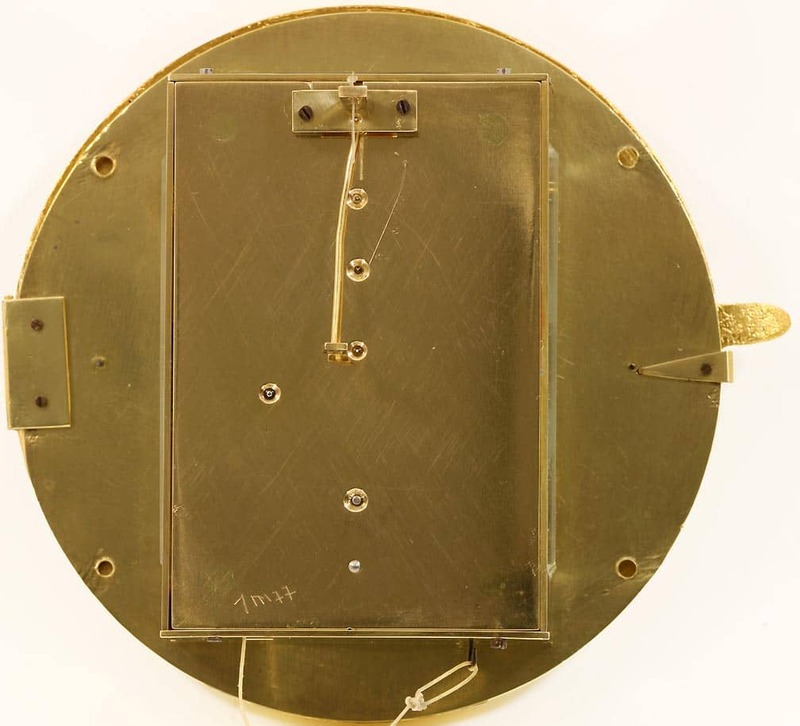 The pendulum is of typical form for the maker with a small brass bob and small shaped steel pendulum rod. The pendulum is silk suspended from the back of the movement. 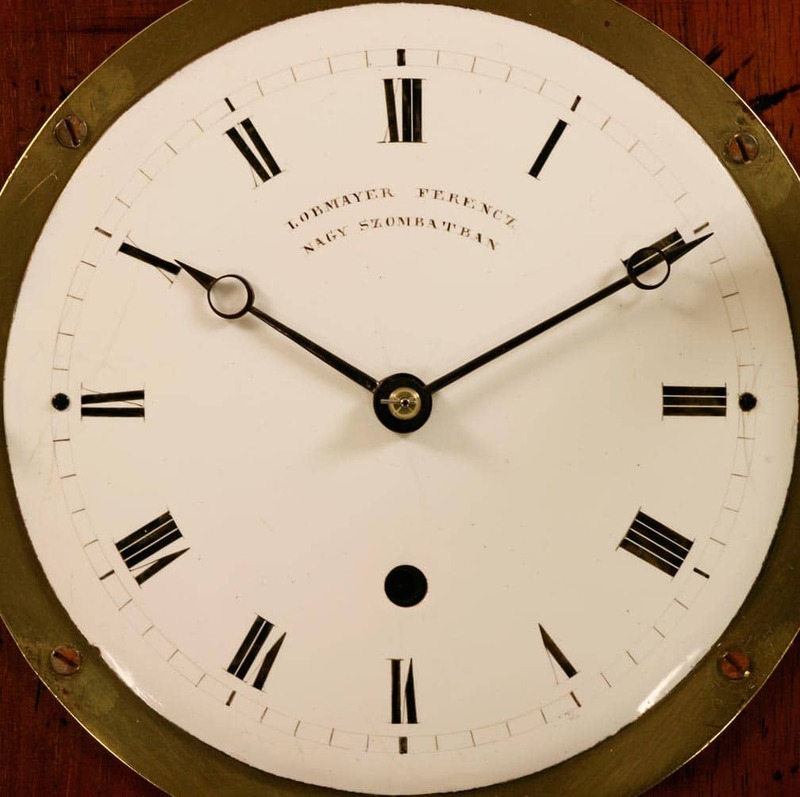 The tiny eight day movement is quite exquisite having both weight drive via the main barrel and also a subsidiary amount of drive from a spring attached to the same barrel. In order that the weight and the spring wind up together the clock is fitted with stop work. 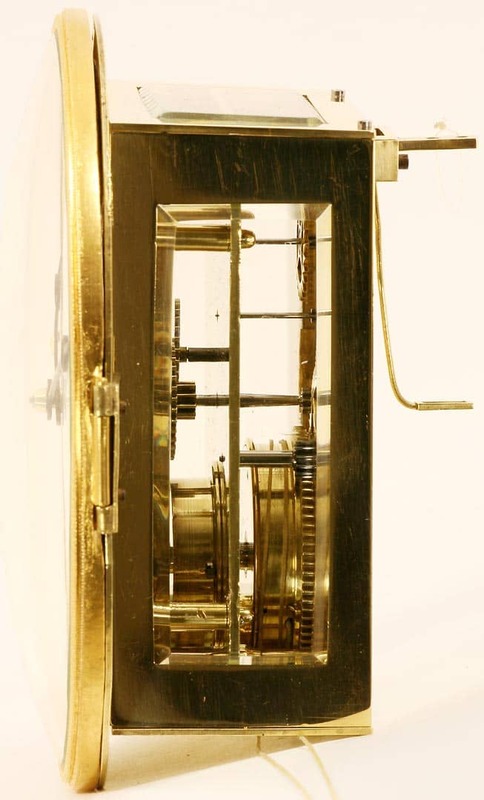 In addition to this it has a deadbeat escapement and the movement is fully glass enclosed which is exceptional for such a tiny clock.